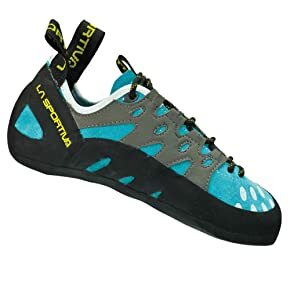 What brand, or better yet pair of shoes, are the best climbing shoes for women? 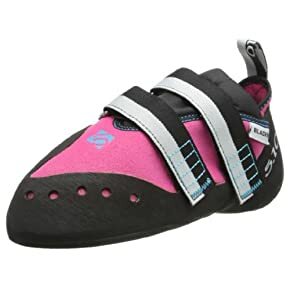 Well, the selection of women’s climbing shoes is ever growing and year after year there are many newer selections available. The reason there are so many options, and no easily defined “best” overall is because rock faces vary around the world. There are volcanic boulders throughout California, granite cracks in Tuolumne, limestone in Greece, red rocks in Germany, not to mention the plastic indoor parks. So with so many types of rock, edges, pockets, and cracks, it is easy to see how different shoes might perform better under different circumstances. 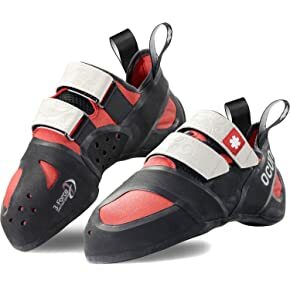 Shoes need to be sensitive to your feet, fitting well enough that you can grip with your toes or hook with your heel, but also still be comfortable when your feet are swollen at the end of a long day bouldering. You want them to be easy to use, come on and off with ease especially when your hands are covered in chalk dust. That is why we have reviewed different shoes so you can figure out which women’s shoes are the best shoes for you! Buying climbing shoes is an arduous process for anyone from beginner to novice. Unlike running shoes, you cannot just walk in and find your size, then be on your merry way. You have to try on each type of shoe, not just the sizes, but the brands, and then the different shoes from different boxes that are “the same size”. 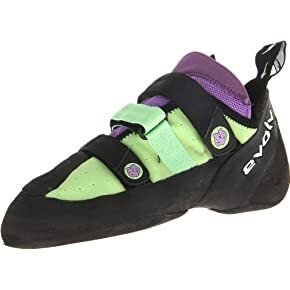 Women’s climbing shoes are different than men’s. This seems obvious, but until recently women had to buy unisex or men’s shoes and it just wasn’t the same. Now, aside from color, women’s climbing shoes are built differently. They are often a bit narrower, especially in the heel. They tend to have higher arches, narrower toe boxes, and longer toe boxes. Most women’s shoes also have a lower instep. These differences can really enhance the fit especially for women who used to struggle with narrow feet inside bigger unisex shoes. So which styles of shoes are out there? 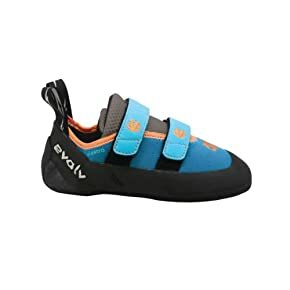 These are high end shoes for bouldering and sport climbing, specifically designed to be worn in steep terrain. Of course, the terrain is not the only thing that is steep; their prices are higher too. They are aggressively turned down, meaning you look at the shoe and it is bent over at both ends before your foot even gets inside. These models are meant to be worn for a single pitch, then removed. They are not comfortable to wear long term. Given the curve of the shoe, your toes are pushed down to the front of the shoe. These are worn tight, meaning they need to feel too tight on your feet, so that you can enjoy higher sensitivity and really feel your way around through the shoe. Shoes that you wear all day for climbing, or jam inside cracks have a flitter toe and their design is more symmetrical. However, they typically have a slight downturn which helps you to be more precise on your technical climbs. Shoes like this can be sized up (meaning you get a size bigger than a tight fit) so that you can wear them on all day routes (where your feet will typically swell by the end of it) or sized down (the opposite, where you get a size smaller) so that they offer a performance fit. These are the best options for a multi-pitch route. Some shoes are designed to take on anything. 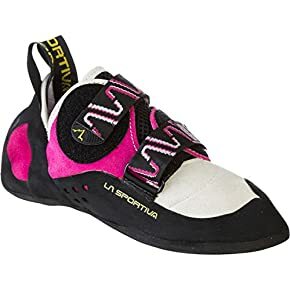 These models are great for that person who wants just one pair of shoes for all of their climbing activities. Even if you do have more advanced shoes, you will probably want that one pair that you can grab on days you don’t really know what you might climb. These shoes have a slight turn down and offer a comfortable but sensitive fit. They can be sized up for better comfort or sized down for a tighter feel. There are loosely fitted models that you can wear for your all-day routes. When you are new, you want beginner shoes. Your footwork will probably be terrible, and you won’t really have developed the muscles or techniques needed to be balancing on a single toe on a ledge no wider than a fingernail. So, inexpensive beginner shoes are best here. You will wear them out as you learn more techniques and once you get the hang of it you can start to really find a more specialized shoe that brings out your best techniques. These have a flatter design and are more comfortable, with an inexpensive price tag to boot. 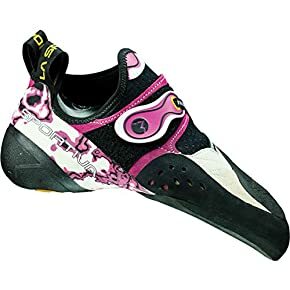 When it comes to choosing the best climbing shoes for women you want to base that on fit. Understand that out of these four types of shoes, the amount of downturn makes shoes more specialized for various types of climbing. Understand as well that the more a shoe is turned down the more volume you will have for your toes to bunch up in the front. If you purchase a shoe which is downturn a lot will have a lot of extra space above your toes but this can be uncomfortable when you climb. For a more aggressive shoe, you want a more comfortable fit. It should be painful but it should fit snugly so that there isn’t a lot of extra room. Tightness is another aspect to the fit of your climbing shoes which is up for debate. There are basically two schools of thought. One school states that your shoes it should be very very tight to the point that they are painful. But the other school thinks that your shoes should be bigger and much more comfortable. 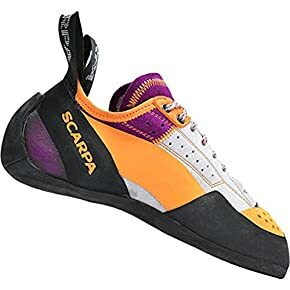 If you have really tight shoes this is perfect for sport climbing when you need higher sensitivity on tiny little flip chips oranges because this can make all the difference between achieving your run and falling off. But remember you don’t want to size your shoes so that it is excruciating. If you are wearing your shoes for a long period of time, such as in all day bouldering outing, having that really tight fit can actually make you climb worse because you will be less likely to put any pressure on your toes because of the pain. So that is why some people want bigger shoes which are not so tight that they caused discomfort. The theory behind this is that your feet will swell the more you are out and being active so if they fit without socks comfortably with a little extra room that is fine for long-term climbing because as you make your way through the day your people swell and fill up that extra room without the shoes becoming excruciating. Then there is the consideration of stretch. Once you figure out how tight you want your shoes, you need to figure out how much you want them to stretch. Pay attention to the materials used so that you can decide how much it might stretch. For example: some shoes have a leather design which means they will stretch more than those which are synthetic. The design is great for beginners, with Velcro straps and a shoe tongue that is sewn in place. This keeps it from moving around as you slip your shoes on and off. A decent price too, they offer strong grip and precision. Whether you are wearing them outdoors or practicing indoors, they will give beginners a good feel for what it means to grip a boulder, ledge, or crack with your toes. They fit well, especially for beginners. They are somewhat expensive and can be harder to find depending on where you live. These are extremely comfortable if you want a downturned shoe. This is the shoe to buy if you want an aggressive fit. Better than comparable shoes. In terms of the ultimate in aggressive shoe, this is it. It has one of the most dramatic downturns but is still remarkably sensitive with a lot of comfort. The sole has a soft feel to it, not a stiff one. Yet, you will feel it mold to your foot and help your foot conform to the wall so that you get the best precision possible. With a soft tongue, you can enjoy a snug fit to help you take down your most challenging of projects. For steep or difficult climbing, this truly is a winner. They are aggressive for sport climbing. They are very sensitive and precise on any type of rock face. They are specialized, so they are only meant for aggressive sport climbing. These shoes are perfect for beginners, the ideal shoe for a first time buyer. They are cheap, with leather upper and a flat shape. They can be used for most styles, and will remain comfortable. This is one of the best budget models for beginners out there. As a beginner, if you want an inexpensive and comfortable shoe, you want this one. Climbers who are new are often not ready for an aggressive shoe with its shape or feel. Moreover, new climbers who are inexperienced but wear an aggressive shoe will likely blow out the rubber with poor footwork. It is better to get a flatter shoe that is more comfortable, like this one. This might be one of the cheaper shoes out there, but it certainly isn’t one of the worst in performance. It is a great value for its cost and lets you really push on edges when you are climbing for the first time. They have leather for the top part. They are a comfortable fit. They are not really specialized, so this is bad for experienced climbers but great for beginners. These shoes are solid and have Velcro. They have a more aggressive fit and a distinct down turn. They are great for sport climbing or specialized bouldering. These are truly among the best shoes you can buy. They stand out above the rest in terms of their versatility, their precision, and their performance. Women can use these for steep technical climbing by buying them tight. They can be purchased looser for all day routes as well. In either case, they become the perfect chameleon for all types of rocks including limestone and granite. This might just be the best shoe for your all around, go-to shoe. These have a padded heel. You get a precise feel while wearing them. They are great for edging. They are not the best for beginners because they are more aggressive and advanced. These are decent in fit, shape, and price. They are a bit downturned, but you can use them for slightly less aggressive climbing. These shoes mold to your feet really well. They have a precise toe fit. They are versatile, so you can wear them on different adventures. The heel cup is a bit baggy, so it might not be a good fit for everyone. 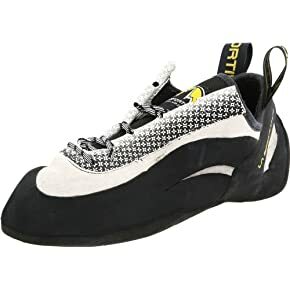 These shoes are an all around climbing shoe that has high performance, is comfortable, and very grippy. With a flatter profile, they are good for someone who wants Velcro straps and a nice fit. The rubber is very sticky. You get great precision and sensitivity wearing them. These are made for narrow feet so many woman who has larger feet might not fit into them. This shoe has bulky toe areas but eventually they will grow on you (no pun intended). They are a nice aggressive shoe that is comfortable and perfect for sport climbing. These are comfortable for downturned shoes. They are perfect for aggressive climbing and cheap when you consider their specialized design. The unique shape with its striking downturn can take some getting used to. These shoes retain bacteria more than others and that means they start to smell much worse after long use. These are great shoes if you are buying your first set of shoes, or you need to buy shoes on a budget. At a cost below $100, it can be a relief to see their price tag after hours of expensive shoe reviews. The rubber is more durable than other shoes because of their unique Variable Thickness Rand. They seem to fit too flat. They are low around the heel, which is bad when you are trying to heel hook something. These shoes are one of the more aggressive you will find. They do, however, have some issues with fit and won’t stay comfortable for long. These are sticky and good on most rock faces. The shoes are aggressive and precise. Not for beginners, as they are aggressive design and expensive. They are sized extra small, so be warned. There is too much curve on one side. The heel cup is loose. This shoe is redesigned and has a nice flat shape with stiffness that makes it perfect for all day routes. The shoe feel good and has laces which run diagonally across the shoe so that they don’t get torn to bits inside cracks. You can wear them all day. For women who want to enjoy all day wear, this comfortable fit, stiffer midsole, and flatter shape lets you fit into cracks comfortably but still wear the shoe all day. Perfect for long term practice on any type of rock in any type of environment. Precise and stiff, they give you a great feel on the rock. Even though there are laces, they are placed thoughtfully. They really only fit narrow feet. Overall, there are many things to consider when you are buying shoes. It is entirely up to you to determine which parameters are most important for you. You can get all the advice from other climbers that you want, but in the end, it comes down to what you prefer, where you will be bouldering, and your budget. 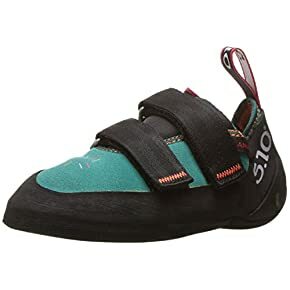 One of the best ways to find shoes that you like without investing a lot of money is to find a local bouldering gym indoors or outdoors. At these locations you can rent shoes. So you can start off by renting shoes, and asking to try different brands that they offer regularly. This will give you a literal feel for the shoes on different runs. This can help provide some hands on (or feet on) experience with each pair before you buy.